March 10th, 2014 – Europe’s flagship Mixed Martial Arts promotion, BAMMA, has added an preliminary match up to BAMMA 15, which takes place at the Copper Box in London’s Olympic Park on 5th April. 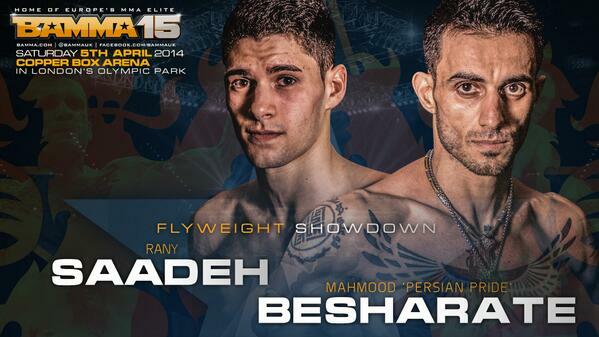 Mahmood Besharate meets Rany Saadeh at Flyweight. Mahmood ‘Persian Pride’ Besharate is undefeated with a professional MMA record of 5-0-0 and was also unbeaten at Amateur level. His victories have come via TKO, Submission and Decision. Besharate originates from Iran but now trains in Nottingham with Team Rough House. Besharate made his BAMMA debut at BAMMA 12 against Steven Gardener to clinch a victory via Unanimous Decision; and at BAMMA 14 he also beat Joe Laurence over the distance. A Muay Thai veteran with 15 years of Taekwondo behind him, Besharate reached 4th Dan level in Taekwondo and a earned a silver medal at International level. He also holds a British title in K1. Besharate is a member of the Army Reserve with The Royal Yeomanry. Germany’s Rany Saadeh is exclusively signed to BAMMA and fights out of IMAG fight team in Berlin. He holds a professional MMA record of 5-1-0 with victories by TKO and Submission, the majority gained within the first 2 rounds. Having studied karate since the age of 5, Saadeh began training in MMA at 14 and turned professional at 18, following a few bouts at Amateur level. The 20 year old made an impression in the UK, when he stepped in to win the Made 4 the Cage British Flyweight title at just 5 days notice. Saadeh debuted at BAMMA for BAMMA 13 where he defeated Danny Missin via TKO in the 2nd round. BAMMA IS BROADCAST ON 5* IN THE UK, AXS-TV IN THE US, KIX IN ASIA, ABU DHABI TV IN THE MIDDLE EAST,THE FIGHT NETWORK IN CANADA, EXTREME SPORTS CHANNEL IN EUROPE, SETANTA IN AFRICA, SONY IN RUSSIA & TRANSYLVANIA MEDIA IN ROMANIA.